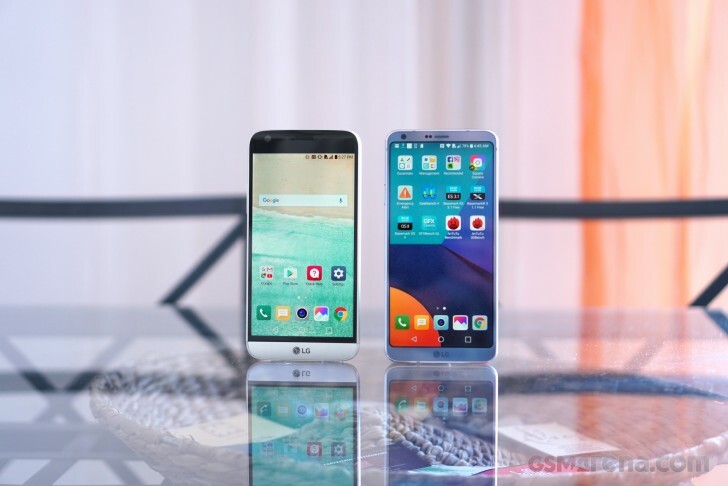 Out walks the flagship, in comes the bestseller - with the G6 LG isn't striving for a top spot in the specs race, instead it's aiming to appeal to a broader audience and trying to differentiate the Gs from the Vs in the lineup. Believe it or not, the G6 will be LG's value proposition in the high-end segment. That may be an oxymoron, but it's a really well-rounded device with a few noteworthy features. The hallmark of the G6 is its display - a 5.7-inch panel fitted in the same footprint as the 5.3-inch G5. The trick? It's in a first-on-a-phone 18:9 aspect ratio (we could call it 2:1, but it won't be immediately noticeable it's taller than a 16:9 screen, LG's marketing team thought likewise). Its resolution is 2,880x1,440 pixels, it complies to the HDR 10 and Dolby Vision HDR video standards, and LG promises a 600-nit max brightness in direct sunlight. Well-worthy of a high-end smartphone, then. Back to that 'value' bit above, however - it won't be the Snapdragon 835 ticking inside the handset. On the one hand Samsung has dibs on the first batches of Qualcomm's latest chip for the Galaxy S8, on the other - the S821 is a proven performer, and one that LG's had plenty of time to optimize for. It's also not the first time LG has opted for the second greatest SoC Qualcomm has to offer - in the days of the troubled S810, the G4 was doing just fine with the S808. With the concept of flagship shifted to mean 'the one we sell the most of', at least from LG's perspective, it's no wonder that the G6 comes with 4GB of RAM and 32GB of storage - we expect a little more from the true top-of-the-line model. There will be versions with 64GB of storage, but only in some regions of the world. Which brings us to one of the main gripes with the LG G6, even before we get to hold one. There will be a Quad-DAC for high-quality audio output, but only on the Korean version of the headset. There will be an FM radio receiver, only not in Korea, Canada and the United States. There will be wireless charging, but only in the US. All these region-dependent specifics mean that you can't really get a fully-loaded G6 with all the bells and whistles. At least the choice will be pre-made for you - whatever version is destined for your market is the one you get, no dilemmas. Regardless of locale, however, every G6 comes with a pair of cameras on its back - one covers a crazy 125-degree field of view, the other - a more pedestrian 71 degrees. Just like the G5 and V20 before it, only not quite - the G6 packs two 13MP shooters, now in 4:3 aspect, instead of the 16MP+8MP 16:9 configurations of previous models. Both new cameras cover a slightly narrower FOV than before. As for selfies - it's just a 5MP snapper on the front, but again one that gets a lot in the frame - it covers a 100-defree field of view. The 3,300mAh battery inside the G6 packs 18% more capacity than the G5 before it - that can't be bad. It's sealed-in this time though, so you won't be able to pop in a fully charged one for instant 0 to 100% battery. Oh yes, the snap-on Friends accessories will remain a one-off for the G5, at least for the time being - one of the not-so-successful experiments on the previous generation, or at least tough to market, if you ask us. The G5 is in the past though, and we're living in the today. That means some quality time with the G6 we have handy, and we'll share our first impressions with you on the following pages.